Total Project Construction is a company whose name says it all. Founded in 2005, the company is a response to what founder Troy Magyar saw as a need to create a commercial construction company that was at once professional and personal. When examining the project management landscape, Magyar realised he needed to create his own business in order to deliver to his philosophy. “We wanted to be more for the client,” he says. “This wasn’t a move I made for myself, I like to think, but one that was for the client. I was able to open Total Project Construction with this focus on the client.” Today, with 20 fulltime staff, Total Project Construction aims to serve its clients with unparalleled service. The business has evolved significantly since its inception, thanks mostly to the talent/ and skill of Magyar and his staff. “Not many companies grow as fast as we did. 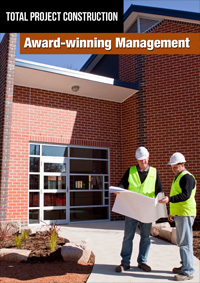 We started off with only our staff and few subcontractors – many of which had worked with me before. As we grew we have kept the same core group of people with us, but the scope of our work has grown,” says Magyar. Many of those subcontractors are now fulltime employees, and have added to the value of the company as a whole. Their ability to secure these ‘top jobs’ comes down to their excellent working relationship with their clients, reports Magyar. “In the case of the schools that we work for, we look to get input from everyone. And that means listening to the principles, the families that surround the schools, and the families of the students. Through building these relationships, we have become often requested and a preferred builder of sorts. This makes a real difference,” he says. “We have to be more than a builder,” Magyar adds. “We are not just a builder on site. 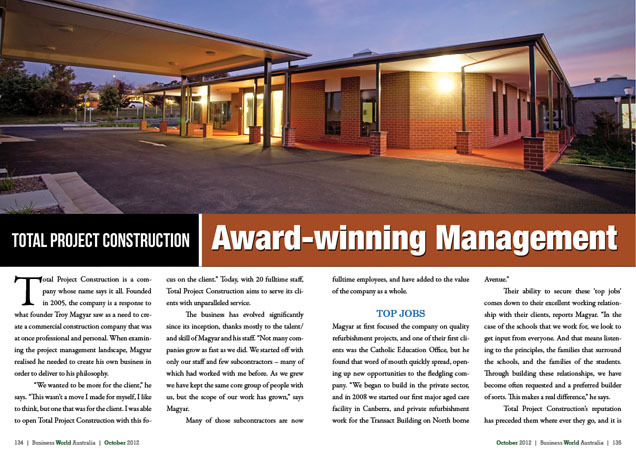 We care about the schools that we build and the results that we give.” As a company, Total Project Construction has a real stake in the quality outcome of their projects. This pushes them to go the extra mile, and the results are readily apparent. Another aspect of their building that they do not take lightly is the environmental policies they have in place. Although in the past six years there have been a lot of legislative changes, Magyar says that they have always approached their own environmental policies as they have the rest of their building practices – they build for the future, and they look at being real stewards for that future. “It’s key and a real passion of ours to reduce our impact, and continue to do better,” he says. According to Magyar, the company’s service – and the number of happy clients it has resulted in – is the best way to demonstrate the success of Total Project Construction. Another, only slightly less important demonstration would be the number of awards the business has generated. That award recognition has not slowed in the years since. 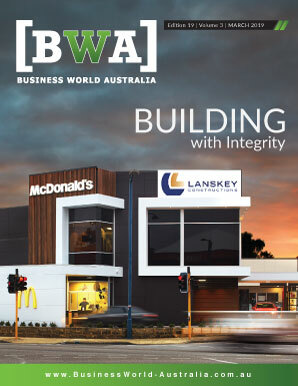 In 2012, Total Project Construction won MBA Awards for Special Purpose Dwelling, Commercial and Retail Fit Out, Refurbishment or Alteration $500K – $1M, and Commercial Building Less than $5M. “We are totally blown away with the industry awards that we have received,” Magyar says. “In only six years we have managed to win four major awards.” They have also now been nominated for a National Award. If employees have a family issue, Total Project Construction realises that family comes first and they will work to ensure that employees feel like they can count on their employer to provide for them not only monetarily, but support-wise as well. The challenges of the past few years, with the Global Financial Crisis, have made Total Project Construction examine their future with new insight. They know that the industry has changed, and that they will face challenges that no other businesses have before. With their team of dedicated staff they aim to take advantage of current and future prospects and continue to deliver on their name: Total Project Construction.